1.) ... The listing of fonts under Windows! 2.) ... Export as image file from the selected fonts! 3.) ... what is the font drop-down list for? 4.) ... Exclude subfolders while listing the fonts! Tip:► use the fonts without installing the windows font file? 1.) The listing of fonts under Windows! Image-1: view (show) the not installed fonts! It is quite easy not only to look at and inspect uninstalled fonts under Windows 10, this function is available to you with this free tool under all Windows operating systems, such as --- OS_Windows6 ---, as it is also a portable application works and thus can be executed without installation, you can use it everywhere. Please use ... always the latest version of FontViewOK ! A font is a graphical representation of text that may contain a different font, point size, weight, color, or design. You may be familiar with the fonts used to display the currently installed fonts, or install or uninstall fonts. Not only Android and MAC have nice font functions, this control panel in Windows could not use any newer font functions, such as: As color fonts, or display variable fonts and an update was required. As of Windows 10 2018, Microsoft introduces new features for managing your fonts in Preferences. ►►► How to Preview Fonts installed in Windows 10 ! 2.) Export as image file from the selected fonts! (Image-2) Create a Image from selected fonts ergo create picture file! Here you have found a great Windows freeware that let you easily browse the installed fonts on your computer so you know what's available to you in your Windows applications. Of course, you can use the Fonts drop-down menu in any application, but they are often awkward and do not allow you to select the sample text. This can be a flagship of the future under the new Windows 10, which is constantly being improved by Microsoft. You can easily use this simple and fast font solution on older versions of Microsoft's Windows operating systems, whether it's a Windows desktop, tablet, Surface Pro / Go, or even a server operating system. 3.) What is the selection field for the fonts available for? I just start to play with your helpful program. What is the effect of the font name drop-down list? Displays the selected font name in the list view and, if necessary, selects a different font in the list view. I will give more meaning to this box in the next versions. (Image-3) Selection field for font name in windows Fonts-View! 4.) As of 5.04 it is possible to exclude subfolders when listing the fonts! (Image-4) Show not installed windows fonts without subfolders! 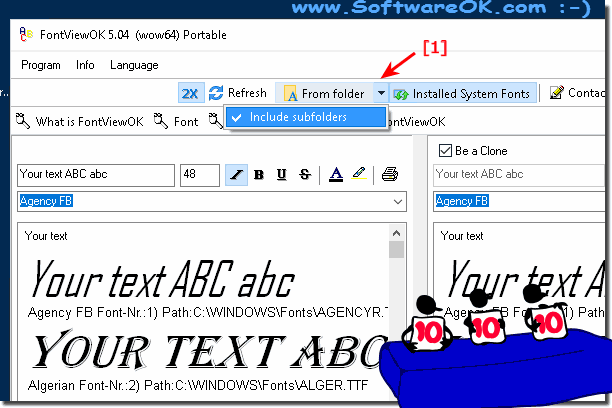 No matter if with or without sub-folder the fonts can be listed quite clearly, under all Windows systems! 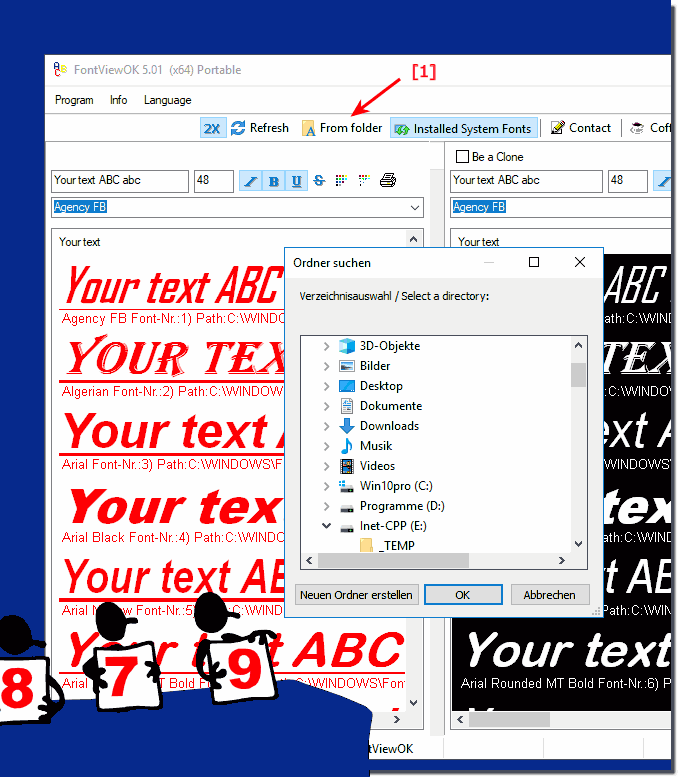 FontViewOK - FAQ-1: How can I view (show) the not installed windows fonts? Display Non installed fonts without install it? Windows shows not installed fonts? How to viw fonts not downloaded? How can You See a Font on Windows 10, 8,1 in a Document Even Though it is not Installed? 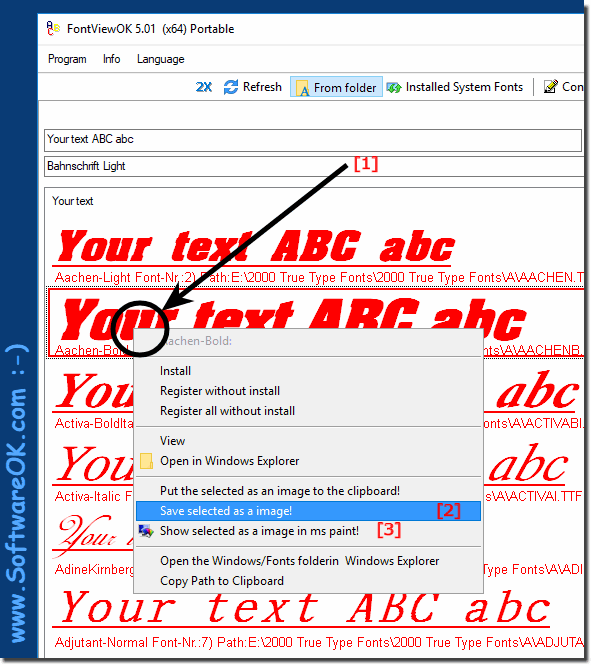 How to see install or removed font in Windows from Microsoft OS Support? How to preview install and removed and hide fonts in Windows 10, 8.1 and 7? Preview Fonts in Windows 10? How to can I view a website's font if you don't have the font installed on Windows? Truetype font not listed in Windows Manager but is installed how to show the Font?